Your business is visual by nature. As a wide format printer, you create beautiful works of art on a regular basis, but only a small part of the world ever gets to see them. As we discussed in our previous blog, marketing your business is a must if you hope to survive. And if you have not already, it is imperative you begin utilising the Internet as a place to showcase your work. Two social media channels—Facebook and Instagram—offer great opportunities for visual businesses, such as a wide format printer like yourself. Stay tuned as we discuss tips for making use of these two visual platforms. Once you have your Facebook and Instagram business profiles set up, it’s time to start posting your work! You already have a slew of print inventory to choose from, so pick some of your favorites you believe will best show off your services. Interesting graphics, bright colors, intriguing black and whites and new techniques will all do the trick. Be sure to add a line of text explaining the project and maybe even where interested parties could see it in real life. If appropriate, be sure to ask clients ahead of time if they mind you posting their projects. Or, play it safe and post the great work you create for your brand or just for fun. Quick Tip: Don’t let your favorite photos disappear down your Facebook Timeline! Repost your favorite photos to the top of your Page in two easy steps. Click here to learn how. Hashtags are clickable links where everything posted about a certain topic or phrase can be found. Hashtags have become almost like modern-day chatrooms. Jump into the conversation already being held on Facebook and Instagram by tagging your photos with Hashtags like #art and #design, or get your own hashtag trending! The opportunity for creativity is endless. Quick Tip: To create a hashtag, use the # (number sign) along with a topic or phrase written as one word, and then add to your post. 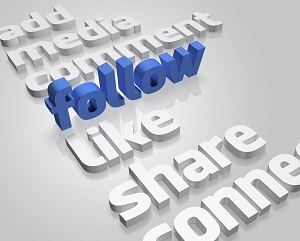 Utilising social media platforms is all about engaging with other users. Whilst hashtags can help your business enter the conversation, they won’t help it stay there. Seek out relevant users, such as business owners, graphic designers or advertising executives to follow, then leave interesting, applicable comments on their work or simply give them a “Like”. Remember, being social is a two-way street. Quick Tip: If someone leaves comments on your work, don’t forget to respond and follow back any relevant users! For more tips on boosting your bottom line with wide format printing, download our free guide today.